Wednesday, January 30, 2019 Category: MTB, M&T Home Loans Mortgage Rates and Calculator. 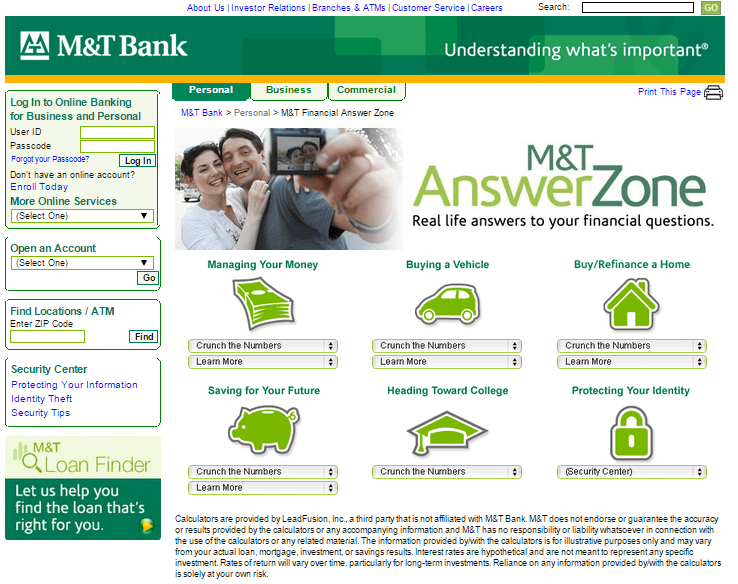 M&T bank offers its clients a free service of calculators. If you are seeking a mortgage loan or still doesn’t know if the best option for you is to buy or rent a property, check this feature. In the bank website there is a page dedicated exclusively to financial questions. Here you’ll get an explanation of each calculator for those who want to buy or rent a property. 1- How much can I borrow? 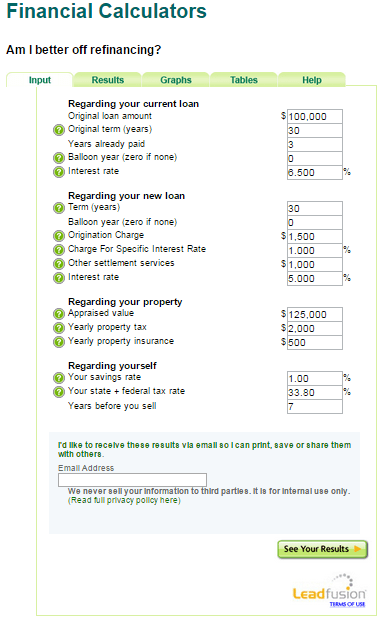 Use this calculator to check what is the loan amount that best apply to your current economic situation. After doing it, click in “See Your Results” . Notice that you can navigate by tabs located in the top of the calculator. 2- How much will my mortgage payments be? 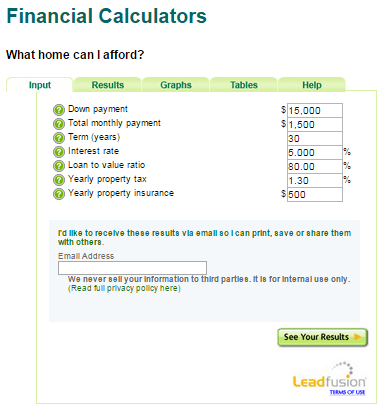 For those who are seeking a mortgage loan this is the best calculator. 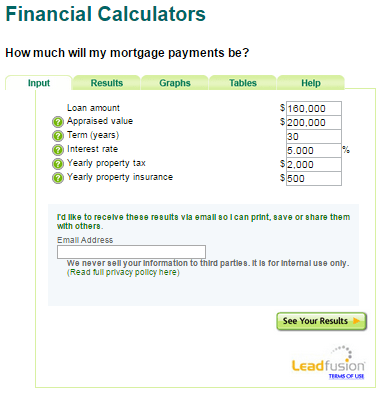 It will show you, according to your loan terms, how much will your mortgage payments be. All you have to do is to fill in with the required information as seen above and click in “See Your Results”. 3-Which is better: 15- or 30- year loan term? 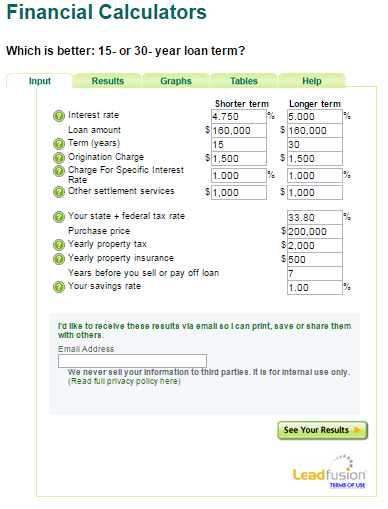 If you’re still in doubt about your loan term, check this calculator. Make the calculus and check what better applies to you. 4-How much should I put down for a new home? This calculator will show you what is the down payment you’ll have to do to buy the desired property. Following the same model, all you have to do is fill in with the required information as seen above and click in See Your Results. 5-Am I better off refinancing? Sometimes the economic situation changes and you may start asking yourself if refinancing your loan isn’t the best option. Check this calculator to see if you’re doing the best thing. 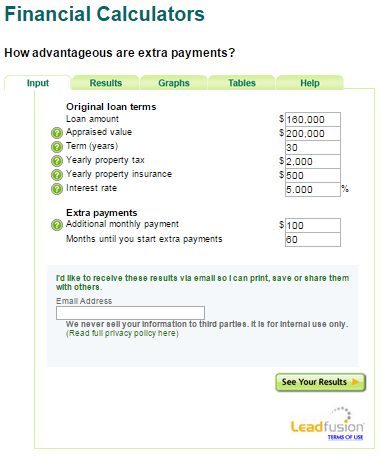 6-How advantageous are extra payments? 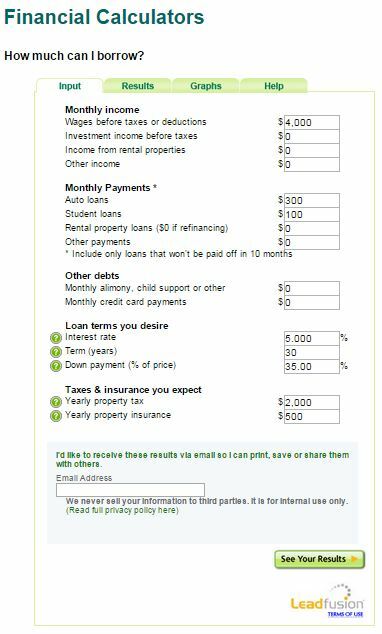 If you don’t consider refinancing but want to do an extra payment, check with this calculator if you’re doing the best thing. All you have to do is to fill in with the required information as seen below. 7-What home can I afford? Last but not least you’ll find the calculator that will show you what is the max amount that you can afford according to your current economic situation. You can adjust filling in the blanks according to your income available.